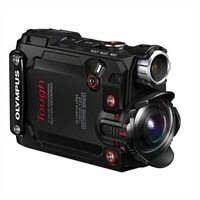 Olympus Stylus Tough TG-Tracker - action cameraPresenting an action cam that's tough enough to keep up with your adventures. The pocket-sized TG-Tracker records Ultra HD 4K video using advanced Olympus optics. Take it places you wouldn't dare take most cameras. Mountaintops. Winter slopes. Whitewater rafting or into the waves. Drop it, freeze it, submerge it, and it will just keep shooting - even 100 ft (30 m) underwater, no protective housing required. Handy extras like the LED headlight and the tilt-out monitor help you nail difficult shots. Use the built-in Action Track Sensors, GPS, and Wi-Fi to record and share every awesome moment. The TG-Tracker. It loves adventure as much as you do. Sure, TG-Tracker looks rugged and compact, but there's more here than meets the eye. That's because Olympus Tough cameras are built strong so you can concentrate on getting great shots. TG-Tracker is waterproof to depths of 100 ft (30 m), crushproof up to 220 lbf (100 kgf), shockproof from 7 ft (2.1 m), freezeproof to 14°F (-10°C), and dustproof. Most other action cams need protective housings. That means more stuff to carry, clumsy camera operation, and a difficult time capturing sound. With TG-Tracker, no housing equals better overall performance. Record your adventures with so much vivid detail you'll feel like you're watching real life. That's the amazing resolution you get with Ultra HD 4K 30p video. Besides 4K, TG-Tracker gives you shooting options in Full HD 1080, HD 720, and standard definition, each with several frame rate options. Use the High Speed HD Video mode for slow-motion playback and the 4K Time Lapse Video mode to record captivating short video of long periods of time. The Loop Recording mode shoots continuously in 29 minute increments. Even still photos are covered with TG-Tracker's Still Shot mode. TG-Tracker's BSI CMOS sensor works with the TruePic VII for 4K Image Processor for video and stills rich with detail and vibrant color. Electronic 5-Axis Image Stabilization compensates for all types of movement, and the bright F2.0 aperture shoots clearly in low light and underwater. The 204° extreme-wide angle lens provides a dramatic, almost panoramic perspective. Sensor technology helps to track everything you see and do for an immersive experience that goes beyond video. There are five Action Track Sensors built into TG-Tracker. You'll find a GPS so you'll always know where you are. The e.Compass indicates direction. An accelerometer measures g-force. Keep an eye on your altitude or water depth with the barometric pressure sensor. The fifth sensor records ambient temperature. View real-time data on TG-Tracker's tilt-out LCD monitor. Activate Data Log Mode to record data without video for extended periods of time with limited battery use. You're watching the sunrise from 12,000 feet above sea level. The climb was awesome and the video is spectacular. Get it to your friends, family, and social sites fast using TG-Tracker's built-in Wi-Fi. Quickly sync your smart device to your camera with the easy QR Code setup. Use the OI.Share app to remotely change settings and wirelessly share your shots. Use the OI.Track app to store still shots, video, and log data all on your smart device, then view videos and data simultaneously to relive the excitement. Your data is a record of your adventure. Have fun sharing your achievements. Presenting an action cam that's tough enough to keep up with your adventures. The pocket-sized TG-Tracker records Ultra HD 4K video using advanced Olympus optics. Take it places you wouldn't dare take most cameras. Mountaintops. Winter slopes. Whitewater rafting or into the waves. Drop it, freeze it, submerge it, and it will just keep shooting - even 100 ft (30 m) underwater, no protective housing required. Handy extras like the LED headlight and the tilt-out monitor help you nail difficult shots. Use the built-in Action Track Sensors, GPS, and Wi-Fi to record and share every awesome moment. The TG-Tracker. It loves adventure as much as you do.